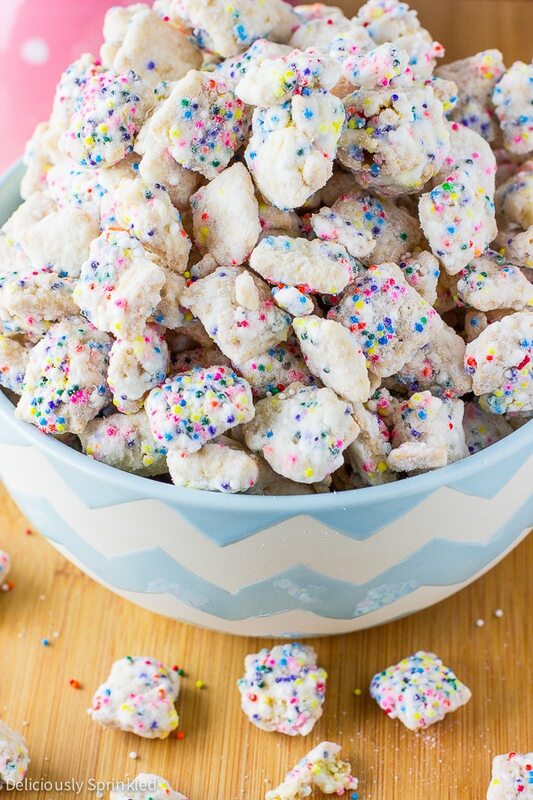 This Sugar Cookie Puppy Chow will not only be a hit…it’ll steal the spotlight each and every time! I often find myself thinking back to my childhood years about snacks and treats that I really, really loved. While it’s hard to narrow it down, two that I loved then (and still do now!) are sugar cookies and puppy chow. I mean, seriously. They are so good. And how my mind works…is if they were that good separate, how would they be combined? AMAZING is the answer. Absolutely amazing. There are few food items in this world that stop me in my tracks, but this one does. I love the sweetness, I love the combined flavors, and I love the fact that it’s all my childhood flavor memories wrapped up in one nice, neat little snack. I’ve taken this to parties, family get-togethers, and just made a batch of it to have around the house…and each and every time, it’s 100% a win. Honestly, I have to will myself to stay away from it because I find myself grabbing piece after piece (or sometimes handful after handful!) 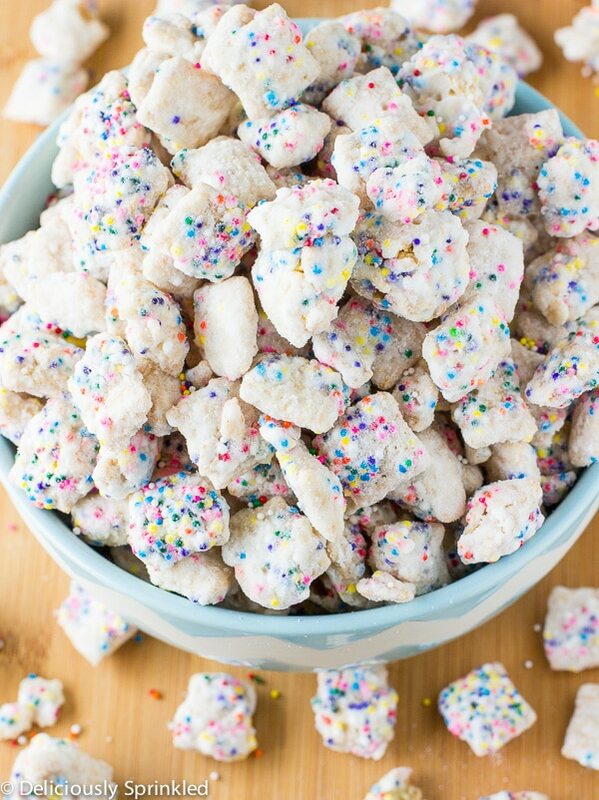 or this amazing Sugar Cookie Puppy Chow. If you are searching for an easy holiday recipe, this is one that you just can’t pass up! ● CHEX CEREAL: you can use the plain Chex cereal or I love using the new Vanilla Chex cereal, it makes this puppy chow even better. 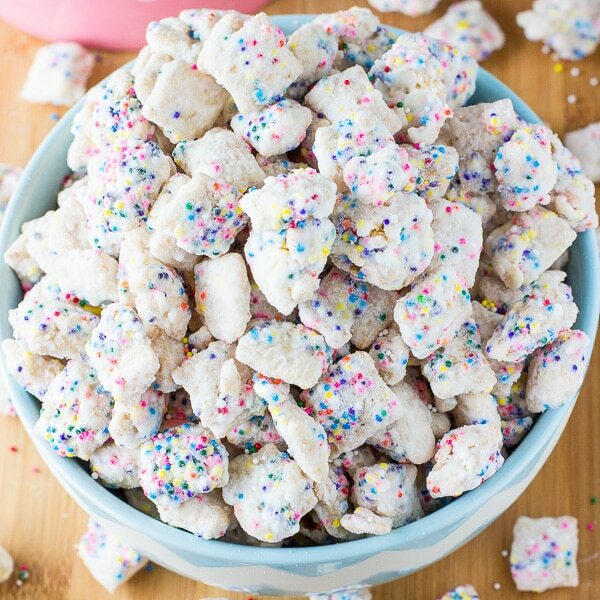 ● ALMOND BARK: I used almond bark because it gives the puppy chow a more “sugar cookie” taste and almond bark holds up better than white chocolate which makes this puppy chow not “soggy”. 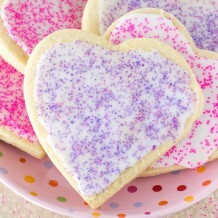 ● SPRINKLES: it wouldn’t be sugar cookies without sprinkles! I love that you can change the sprinkle colors to match the colors of a party or holiday! This is a VERY POPULAR recipe during the holidays! 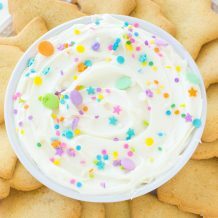 ● FUNFETTI CAKE MIX: you will need 1 1/2 cups of funfetti cake mix! 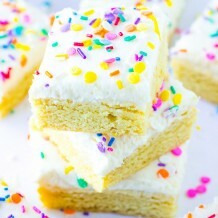 You could also use the vanilla cake mix, as well! STEP 1: Pour the Rice Chex cereal in a large bowl, set aside. STEP 2: In a microwave safe bowl, melt almond bark according to package directions. STEP 3: Pour melted almond bark over cereal. Stir it all together gently, making sure not to break the cereal. STEP 4: Gently, stir in sprinkles. STEP 5: In a large zipped top bag or covered container, add the funfetti cake mix. Pour the almond bark covered cereal into the large bag or container. Seal the bag or container and shake until all the cereal is coated with the funfetti cake mix. STEP 6: Discard excess funfetti cake mix and enjoy. 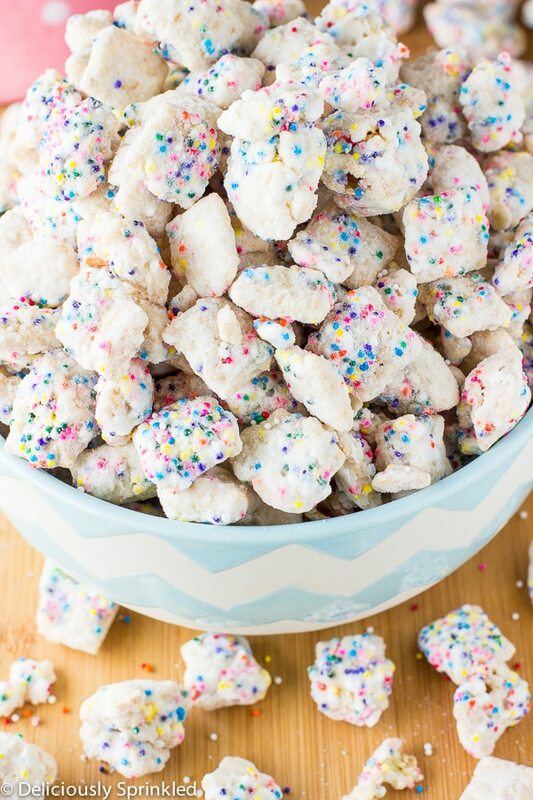 ALMOND BARK: I used almond bark to give this sugar cookie puppy chow that “sugar cookie” flavor. But if you don’t want to use almond bark, you can use white chocolate baking bars…just do NOT use white chocolate chips. 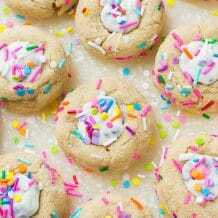 SPRINKLES: like to use nonpareil sprinkles (the little balls) because they mix into the cereal a lot easier then if you would use “normal” rainbow sprinkles. Just be careful when folding the sprinkles into the puppy chow mixture because you don’t want the colors from the sprinkles to run. 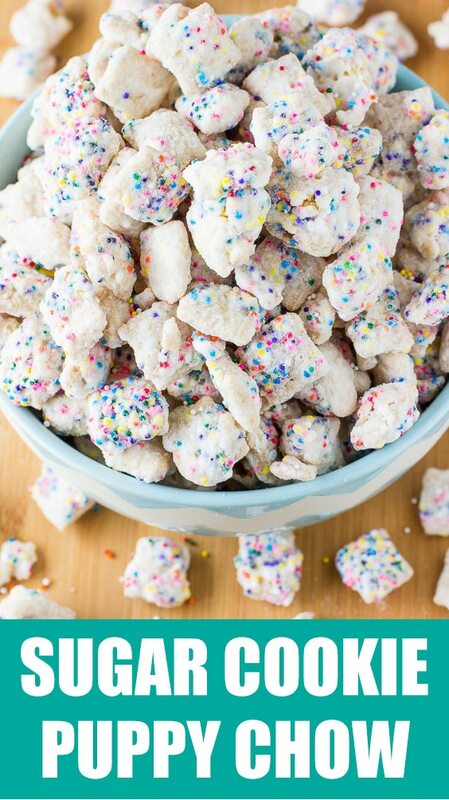 MAKE SAME DAY: I would also recommend making this puppy chow the day you are planning on enjoying it. The longer it sits the less crunchy the puppy chow is, so I like to make it the day of or the night before for the BEST results! MIXING BOWLS: I love these mixing bowls, they’re so durable and the colors are so fun! SPATULA: Everyone needs a GOOD spatula and this one is my favorite! 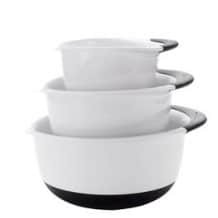 SERVING BOWLS: I love these super cute serving bowls. Pour the Rice Chex cereal in a large bowl, set aside. In a microwave safe bowl, melt almond bark according to package directions. 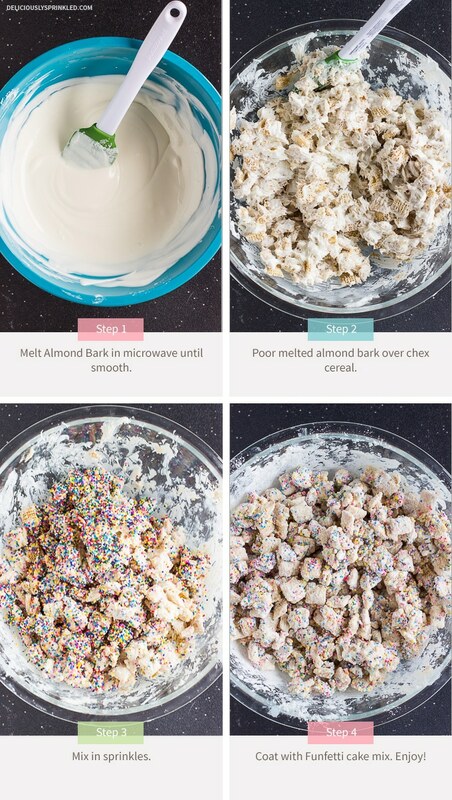 Pour melted almond bark over cereal. Stir it all together gently, making sure not to break the cereal. In a large zipped top bag or covered container, add the funfetti cake mix. Pour the almond bark covered cereal into the large bag or container. Seal the bag or container and shake until all the cereal is coated with the funfetti cake mix. 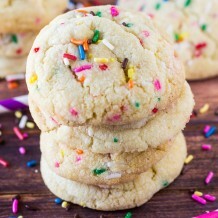 Discard excess funfetti cake mix and enjoy. * Store in a covered container at room temperature for up to 4 days. 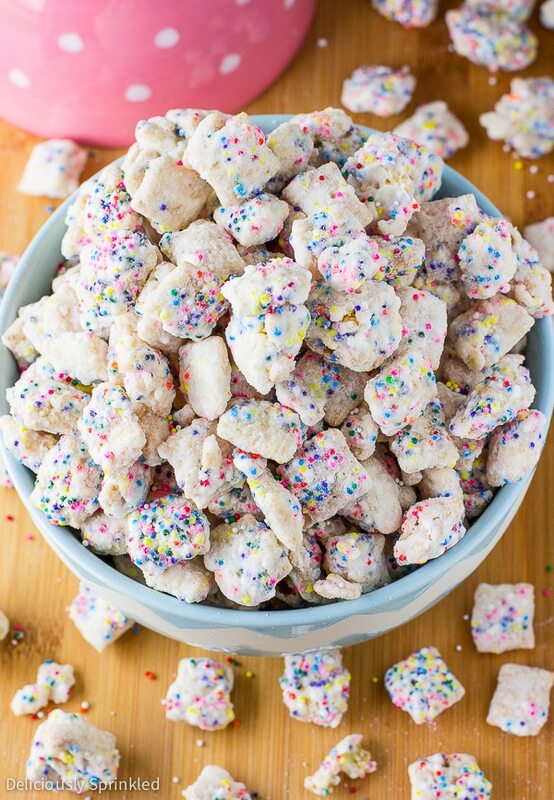 Puppy chow is one of our favorite snack mixes! The sprinkles in this one makes it extra fun! This is top of the list when it comes to my kids requesting snacks! It’s so good! Such a fun hostess gift idea for the holidays! We devoured this recipe – so bright, fun, and delicious! I am LOVING this idea! So fun and delicious. My family would eat these up! Okay, these are so fun and they taste so good! Totally addicted! My kids are going to go absolutely crazy for this! I can’t wait to make it for them. I could totally eat a whole bowl of this puppy chow! So delicious and fun! 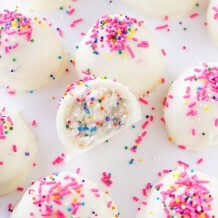 This is seriously the easiest treat to make! And so fun. We’re going to make with red/green sprinkles for Christmas! My kids love these, and they’re so easy to make! So colorful and cute — my girls will love this! Made this today for the 11 cousins (ages 6 to 20) and it was a hit. There was a lot of dry mix in the bottom when I was done, so I think I’ll use 1 cup of cake mix per batch instead of 1 1/2. It’s so easy and fun! I can think of a dozen occasions to share this treat. Thank you! FYI: One box of cake mix contains just a bit more than 3 cups of powder, so enough for two batches, as the recipe is written. Do you have to prepare the cake mix or just mix it in dry? Perfect for the kids on Easter! All my nieces and nephews love this snack! We made this using a gluten free cake mix. Both kids like it!! My husband would go CRAZY for this!!!!! So pretty! GORGEOUS!!!!!!! Can’t wait to try! This looks SO delicious, Jenn! 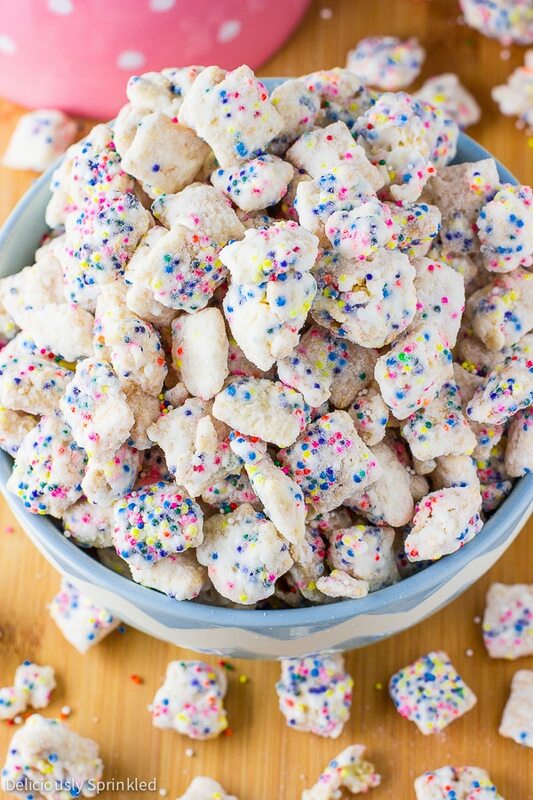 I adore both puppy chow and sugar cookies, and this is perfection. Pinning! Girl this is just pure genius. My mouth is watering just thinking about it! Plus it so festive and colorful. I am sucker for that!